We’d love your help. Let us know what’s wrong with this preview of Q & A by Keith R.A. DeCandido. Nearly two decades ago, Jean-Luc Picard took command of the U.S.S. Enterprise NCC-1701-D. The captain knew it was an honor without equal. His new command bore the name of Enterprise. The people who had commanded other like-named starships had gone down in Starfleet's annals. Some officers would be intimidated, but they would not have been given command of Enterprise. On h Nearly two decades ago, Jean-Luc Picard took command of the U.S.S. Enterprise NCC-1701-D. The captain knew it was an honor without equal. His new command bore the name of Enterprise. The people who had commanded other like-named starships had gone down in Starfleet's annals. Some officers would be intimidated, but they would not have been given command of Enterprise. To ask other readers questions about Q & A, please sign up. I'm short on time again today, so, let me be brief: This was an interesting look at the enigmatic being known as Q. Content Concerns: At least five or six uses each of the h-word and d-word, and almost as many of the a-word; at least one p-word; sci-fi action violence throughout (as you'd expect); references to a sexual relationship between two unmarried characters, though nothing graphic is mentioned. These days, I prefer more original works (though I still happily do most of my reading in the speculative fiction genres). The limitations of licensed novels are both stifling and well known: the individual author has no power to grow or change the main characters When I was growing up, I read more than any kid in my classes: and it was almost entirely licensed fiction: Star Trek and Star Wars mostly. Even today, I still maintain quite the collection of these books, even though I rarely indulge. You can get some decent adventure stories with that setup but it's tough to find anything much deeper. Yet, there's still a bit of room in my heart for the occasional bit of licensed work. Sometimes, it can be fun to go on another romp with beloved characters: especially when they've been off-screen for a decade (and off of television for far longer). In a lot of ways, this book was set up in the worst possible position. It's licensed, so right off the bat, the author has to tread carefully with regards to the license-holder. It's set within the expanded universe, so characters have moved on or died -- and those that remain seem to have laughably stagnant careers. And then there's the entire conceit behind this particular novel: it's going to answer a universe-and-tv-series-spanding question about just what the show's most beloved rogue has been thinking all this time. In a lot of ways Q & A succeeds. It's a fast and enjoyable read. It brings back all of my favorite characters and lets me spend a little time with them. It even ties up all of Q's shenanigans into a nice cohesive (if a bit implausible) bow. But I think the mere fact that it's facing such a tall order is the book's downfall. It has to spend time with all of the major characters (even if they're off the ship), it has to introduce readers to the new characters that are being used to extend the life of the expanded universe franchises, it has to create a universe-spanning threat, it has to resolve that threat, and it has to wrap up a decade's worth of Q's exploits . And it has to do all of that in under 300 light-reading pages. Jiminy. It doesn't really manage all of that. That's not much of a criticism: I don't think it *could* have managed all of that. And there is definitely something to be said just for the fact that it *tried*. More authors should aim so highly, especially in the field of licensed novels where the impulse is always to recycle the same old cliches again and again just to cash a check. It's this book's ambition makes me think that it wasn't a callous attempt at cashing in; unfortunately, that evidence is entirely circumstantial. The bulk of this book is shameless fan-service. It largely consists of characters saying "Do you remember that time we..." before recounting the plot of a favorite episode or the narrator saying something like "He hadn't seen that look since..." before recounting the plot of a favorite episode. It's basically a clip-show in novel form. And those clips take away both pages and pacing from actually telling the story of the book. It's no wonder that the main plot feels rushed and ultimately unfulfilled when so much time is spent recounting events that we all saw on television (because who would read a Star Trek book if they weren't already fans?). 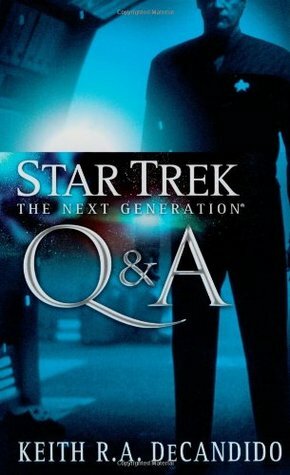 Next up on the post-Nemesis litverse reading list was Q&A, a book by the same guy who wrote the novel Articles of the Federation, which I found to be a travesty. That being the first book by DeCandido that I've read, my first impression was, needless to say, not so good. But as I read Q&A, something happened that rather surprised me. I found myself enjoying the novel. It is an intriguing blend of a light-hearted adventure with serious undertones, and features enjoyable dialogue with one Next up on the post-Nemesis litverse reading list was Q&A, a book by the same guy who wrote the novel Articles of the Federation, which I found to be a travesty. That being the first book by DeCandido that I've read, my first impression was, needless to say, not so good. But as I read Q&A, something happened that rather surprised me. I found myself enjoying the novel. It is an intriguing blend of a light-hearted adventure with serious undertones, and features enjoyable dialogue with one of Star Trek's most beloved nuisances. The snarkiness and belligerence that plagued Articles of the Federation worked perfectly with Q in this book. I found myself actually smiling at the wisecracks and insults, something that never happened in AOTF. The story ties together plot material from several episodes of The Next Generation, meaning that the reader must be familiar with a good deal of canonical material to fully understand what's going on. The conclusion reveals that there was a rhyme and reason to all of Picard's encounters with Q. Along the way, the story gets a bit convoluted, so I would recommend slowing down in the last few chapters. Library book acquired on 2/25/2016. So far its a lot of intertwining stuff we already knew with new stuff. Seeing the new dynamics of the crew in different positions is cool. Q made a mistake giving Riker the Q powers instead of Picard. Nothing new yet. So far all rehash stuff. Intended as a grand event book, the culmination of all the Q encounters of the past (across TNG, VOY, and DS9), the novel succeeds in being readable but not especially rewarding or great. The 20th anniversary novel for TNG (not mentioned anywhere on the cover, but remarked upon in the Afterward). What Q&A does best is focus on Miranda Kadohata and Zelik Leybenzon as the new CO and security chief. I'm looking forward to them growing on me, but the start they're given here isn't all-too remarkab Intended as a grand event book, the culmination of all the Q encounters of the past (across TNG, VOY, and DS9), the novel succeeds in being readable but not especially rewarding or great. What Q&A does best is focus on Miranda Kadohata and Zelik Leybenzon as the new CO and security chief. I'm looking forward to them growing on me, but the start they're given here isn't all-too remarkable, either (introduction of T'Lana as Counselor in the previous novel was memorably handled). i felt the need to read some actual star trek with some actual star trek characters after watching star trek discovery. And while this is a familiar road and with the ever amusing Q, I felt it took a long time to get to its important moments and then was over without much actually happening considering this was a universe ending event. Skipped reading much of it and still got the story. Not that good. Too many connections to past stories, distracting the reader from the current story line plot which was too similar to several earlier plots. In all fairness to DeCandido, I think Q is very hard to pull off in prose format. Too little, and he seems watered down, too much (as happened here), and he's just a tiresome insult generator. I think this book was just too short. In addition to the Q plot, DeCandido also had to introduce several new members of the Enterprise bridge crew, which took up a lot of pages. This review has been hidden because it contains spoilers. To view it, click here. I really wanted to like this. I love Star Trek:The Next Generation and Q and it's obvious the author does too. Unfortunately it didn't translate well onto the page. I think another reviewer put his finger on it saying Q is missing his usual humor. That is definitely part of it. I think the other part of it is DeCandido tries to weave ALL of Q's appearances into one long tapestry culminating in the events of this novel and it only partially works. Mostly what we have are alternating points of view I really wanted to like this. I love Star Trek:The Next Generation and Q and it's obvious the author does too. Unfortunately it didn't translate well onto the page. I think another reviewer put his finger on it saying Q is missing his usual humor. That is definitely part of it. I think the other part of it is DeCandido tries to weave ALL of Q's appearances into one long tapestry culminating in the events of this novel and it only partially works. Mostly what we have are alternating points of view, bouncing over the timeline back and forth over the course of ST:TNG, DS9 & Voyager to cover Q's involvement and nothing 'new' until nearly mid-way in. The rest is either the crew of the Enterprise or various other characters that serve to show planets and star systems are winking out but with no emotional investment in them it's hard to care. Also DeCandido is hampered by that horrible Star Trek:Nemesis movie and the destruction of Data; that and a need to pair off everyone, Deanna and Riker married and moved off ship, Crusher and Picard (which yes, both are canon) but it seems almost their end all be all, while it falls to Geordi and Worf to deal with the new characters, the second in command and new mom to twins (left behind with dad) Miranda Kadohata and new head of security, Leybenzon and oh, angst about Data's loss, a lot. The end result is it's slow, vaguely repetitive as we march toward the end of the universe. The latter half of the book is better. The ideas DeCandido has gel here and they do work. However, the story feels overly long. Even though it's only 290 pages it could have lost about 90 of those and felt like a better paced, more interesting story. I guess it might be just me, but DeCandido is a terrible writer. I've read another one of his works, "Articles of the Federation" and had trouble getting through that one as well. At first I had assumed that he had been trying to emulate the show 'The West Wing' in novel form and it just didn't work. Now I'm pretty sure it's just his writing. The book started off promisingly but I never felt any attachment to any of the characters and felt the author tried to put in far too many scenarios--he ne I guess it might be just me, but DeCandido is a terrible writer. I've read another one of his works, "Articles of the Federation" and had trouble getting through that one as well. At first I had assumed that he had been trying to emulate the show 'The West Wing' in novel form and it just didn't work. Now I'm pretty sure it's just his writing. The book started off promisingly but I never felt any attachment to any of the characters and felt the author tried to put in far too many scenarios--he never stuck with one viewpoint long enough for me to really care. The story involves Q and the end of the universe, literally. What's new, right? How will the Enterprise crew and Captain Picard save everything? Another review said you can't really enjoy this book unless you've seen a lot of 'Star Trek' and I agree. I also think there's a little too much rip-off as well. There are aspects that reminded me very much of the TNG episodes Parallels and All Good Things. Another book, actually called 'Maximum Warp' did a MUCH better job with this scenario, right down to writing chunks of alternate universes. I was somewhat surprised that Q seemed to be a relatively minor character. Based on the title I had assumed he'd dominate the pages more, but I guess based on the structure of the story it would be hard to do without going into overkill. The author (Keith R. A. DeCandido) has to be the most talented writer in the Star Trek bullpen when it comes to dialog. The man can make almost any conversation about anything reasonably interesting and I've enjoyed his writing in the past. With Q & A, Keith attempts to tie together all of Q's appearances throughout the various shows in an attempt to put some greater purpose behind his interest in the humans and Jean Luc in particular. While the answer is interesting - and the particular thin The author (Keith R. A. DeCandido) has to be the most talented writer in the Star Trek bullpen when it comes to dialog. The man can make almost any conversation about anything reasonably interesting and I've enjoyed his writing in the past. With Q & A, Keith attempts to tie together all of Q's appearances throughout the various shows in an attempt to put some greater purpose behind his interest in the humans and Jean Luc in particular. While the answer is interesting - and the particular thing that "saves the day" refreshing - there's very little going on in the story unless you are really a character driven person who enjoys reading about the struggles of keeping a long distance marriage healthy, finding your place in the new crew on the Enterprise or what it's like for Geordie to miss Data. Personally, while I enjoy great dialog when reading a Trek book, I like to couple that with some great action, mystery and intensity and for all of Keith's talents, there wasn't much in the way of those things in this story. For those of us who have followed the show and wondered why Q kept bothering Picard and the Enterprise and wondered why he did the things he did, this is book is a must read. All the answers are here. On a simple survey mission, Captain Picard thought the most difficult challenge he faced was to integrate his new command crew. Commander Miranda Kadohata is Data's handpicked replacement to succeed him as science officer/ops, and Lieutenant Zelik Leybenzon is Worf's choice for security chief. Their For those of us who have followed the show and wondered why Q kept bothering Picard and the Enterprise and wondered why he did the things he did, this is book is a must read. All the answers are here. Their mission is to survey Gorsach IX, but Q showed up, which told them this was much more than a simple planetary survey. After they encountered strange forces on the planet, Q urged them not to explore further, which of course caused Captain Picard to do the exact opposite. Without spoiling the ending, I'll just say that Q spent years bothering the Enterprise crew to prepare them for the possibility that they would one day reach this planet and arrive at this moment. He needed them to deal with something that was beyond even his power, and hoped they remembered everything he "taught" them over the years. I really adore Q, so I had high hopes for this story. Unfortunately, though, he is written in a very unlikeable way, and I found him annoying and lacking in his trademark wit. Also, the author's attempt to connect every single one of Q's appearances on all of the Trek shows into one cohesive plot was far too ambitious, and so fell pretty flat. For such an ambitious plot, there was an awful lot of filler: whole chapters introducing random characters from across the galaxy for no purpose other than I really adore Q, so I had high hopes for this story. Unfortunately, though, he is written in a very unlikeable way, and I found him annoying and lacking in his trademark wit. Also, the author's attempt to connect every single one of Q's appearances on all of the Trek shows into one cohesive plot was far too ambitious, and so fell pretty flat. For such an ambitious plot, there was an awful lot of filler: whole chapters introducing random characters from across the galaxy for no purpose other than to mark time. After a while I learned to skim these sections to get back to the main storyline. The story is set after Nemesis, so two new command officers are introduced to replace Data & Riker. Neither are memorable or very interesting, which is a shame when you consider what a great opportunity was squandered there. The one interesting new character, T'Lana (Troi's replacement), was introduced in a prior book Resistance, and the author did nothing to build on her character at all in this book. Mr. DeCandido does a great job melding many of Q's previous appearances (as well as keeping track of everything else going on in the Trek Novelverse) into a story where Picard destroys the universe. Warning: If you're not familiar with Next Generation Trek, forget it, you may be able to follow the book some but you'll be missing out on plenty. And that warning is really the big problem of the book: it grabs so much history that in the end ... nothing new happens. At all. Events happen a certain wa Mr. DeCandido does a great job melding many of Q's previous appearances (as well as keeping track of everything else going on in the Trek Novelverse) into a story where Picard destroys the universe. And that warning is really the big problem of the book: it grabs so much history that in the end ... nothing new happens. At all. Events happen a certain way because of what has come before, and only because of what has come before. Don't get me wrong, the *idea* behind the book is good, and the character development is strong. But if you don't know what happened before, you'll be lost. But if you do know what happened before, you'll recognize everything. It's a Q Clip Show. I like Star Trek books but I do not read many of them and Janice and I have not bought very many in the last few years. In fact, had she not been Tuckerized in this one, we probably would not have bought it. Having said that, however, I am glad we did. It is a fun romp with Q (I assume you guessed that from the title) and the scattered crew of the Enterprise E.
If you want to know what it means to be Tuckerized, drop me an email and I will explain. The story is about the impending end of the unive I like Star Trek books but I do not read many of them and Janice and I have not bought very many in the last few years. In fact, had she not been Tuckerized in this one, we probably would not have bought it. Having said that, however, I am glad we did. It is a fun romp with Q (I assume you guessed that from the title) and the scattered crew of the Enterprise E.
The story is about the impending end of the universe and Q and Jean-Luc are right in the thick of it. A few changes have taken place after the death of Data – the novels picks up after the film Nemesis. Most of them are good, a few you may not like. It appears that Q’s affairs with the Enterprise crew were not as random as you may have thought. In the end, Keith wraps it up in a very satisfying way and I actually changed my mind about Q. Well, not completely. The book is a fast read, with the characters fitting like a well worn shoe. If you are a ST fan at all, read this book – you will be glad you did. I really enjoyed this book until the last ten percent or so because it got a little confusing and it just fell a little flat for me. I did enjoy this though. There were many sweet parts where Data was mentioned and some hilarious parts with Q. "Q rolled his eyes. "Here is comes. It amazes me that Vulcans even managed space travel, given how much time they've wasted on being pedantic." He grinned. "Of course, they developed space travel before they became boring, which probably explains it. Ah, th I really enjoyed this book until the last ten percent or so because it got a little confusing and it just fell a little flat for me. I did enjoy this though. There were many sweet parts where Data was mentioned and some hilarious parts with Q. "Q rolled his eyes. "Here is comes. It amazes me that Vulcans even managed space travel, given how much time they've wasted on being pedantic." He grinned. "Of course, they developed space travel before they became boring, which probably explains it. Ah, the good ol' days before Surak-that's when your people really knew how to party"
There were many other classic funny Q parts but I don't want to give away too much. Overall a good read. And I have to add my favorit quote because the author captured Wolf so well! "And I promise I won't bring along baby pictures," Kadohata added with a smile. "In that case, I will join you," Worf deadpanned. Or is there something more at play? I enjoyed this book from start to finish... The author does a masterful job in portraying the enterprise crew in a manner that really felt like an episode of the tv series... and the portrayal of Q was spot on. This review has been hidden because it contains spoilers. To view it, click here. I wanted to like this one a lot more than I did. DeCandido nails the character's voices, and the plot is interesting, if a little slowly paced. But he also has an annoying habit of wanting to show off just how knowledgeable he is when it comes to Trek minutiae, which results in characters making deep-cut references in thoughts or dialogue for no reason other than to show off. And oh man, his climax is reaching. A laugh saves the universe? Really? Because Q made Data laugh that one time, and becau I wanted to like this one a lot more than I did. DeCandido nails the character's voices, and the plot is interesting, if a little slowly paced. But he also has an annoying habit of wanting to show off just how knowledgeable he is when it comes to Trek minutiae, which results in characters making deep-cut references in thoughts or dialogue for no reason other than to show off. And oh man, his climax is reaching. A laugh saves the universe? Really? Because Q made Data laugh that one time, and because Picard laughed when he got stabbed? Those moments HAD MEANING AND CONTEXT already, within their respective episodes; using them here cheapens their impact in those episodes. I've never really been a fan of Q, even though John DeLancie did an excellent job of creating the character; for one thing, he did an excellent job of creating a character that was insufferable, and for another, the concept of a character with his power and that personality being even moderately interested in the doings of humans (much less the doings of one specific human, Picard, hardly the most fascinating of all humans) has always struck me as seriously implausible. Nonetheless, this book man I've never really been a fan of Q, even though John DeLancie did an excellent job of creating the character; for one thing, he did an excellent job of creating a character that was insufferable, and for another, the concept of a character with his power and that personality being even moderately interested in the doings of humans (much less the doings of one specific human, Picard, hardly the most fascinating of all humans) has always struck me as seriously implausible. This Trek relaunch novel makes up for the travesty of "Resistance." And manages to make some sense and resolve some issues with the many appearances of the being known as Q over the years. Q once again embroils Jean-Luc Picard (and Worf) in a universe-spanning prank or plan, and many questions are answered. And, not to spoil anything, the story continues on without any magical resurrections (I had feared that a major character might come back as a reward or a threat, but nope). This was a tale ri This Trek relaunch novel makes up for the travesty of "Resistance." And manages to make some sense and resolve some issues with the many appearances of the being known as Q over the years. Q once again embroils Jean-Luc Picard (and Worf) in a universe-spanning prank or plan, and many questions are answered. And, not to spoil anything, the story continues on without any magical resurrections (I had feared that a major character might come back as a reward or a threat, but nope). Q is a fun character, but I don't think this story really added anything to books like Q Squared. The characterisation is pretty solid, including the new characters. The only iffy bit was when Worf reflected that he'd only ever been happy on the Enterprise; what about his marriage to Jadzia? Still, I realise that the author is constrained by what happened in "Nemesis". Overall, an entertaining way to spend a few hours, but nothing particularly significant. If you are a fan of Star Trek, this book is the ultimate “Q” saga. Not only does this book tie together all of the Star Trek Q TV episodes, it expands them into one grand story. Picard and the crew of the USS Enterprise have been harassed by Q since they first encountered him during their mission to Farpoint. But that was then and this is now: new crew, new ship and a new adventure but with a far more serious Q.
Q visits the Enterprise again, to help them stop the universe dying. What I really liked about this book is that it gives reasons for every one of his appearances on the TV shows, and it actually makes a lot of sense. It is all about Q trying to save the universe, and I like the bits were he is arguing with other Q's. Worf shines in this novel, as he becomes used to being first officer. Geordi is still getting used to the death of Data. A really good read. Q is definitely not my favorite villain/savior but he's not my least favorite either. All in all this is just a fun & easy short read that (no offense to the author) is on a slightly lower reading level than say something like David Mack or Diane Duane would write. But no doubt the author intended as much & i think he wrote a pretty entertaining story that Trek fans will enjoy. One simple letter, a name that evokes feelings of trepidation and dread in any Starfleet captain. He's back. And he wants to bug Jean-Luc yet again. DeCandido does a wonderful job tying certain parts of Next Generation Q lore together (including some of the Q novels) and brings Q to life inside.